I've previously noticed that Safe Kids Canada did not in any way encourage parents to get their kids walking and riding their bikes. The advice was basically: "While biking is a healthy activity, vast numbers of kids who cycle get all smashed up. It isn't safe." There was even a direct statement that children under the age of 10 should not ride on roads at all. I saw today a useful web site by a group called "Active Healthy Kids Canada" (AHKC), whose mission is (as the name suggests) to encourage healthy physical activity in kids. Unfortunately, in their 2013 "report card", they could only give Canada a D-. I am writing to alert you to the fact that, unwittingly, Parachute might be contributing to this sorry situation. According to AHKC, a big part of the inactivity problem is that our kids are increasingly being driven to destinations, rather than walking or biking. I have searched your web site for positive guidance on this question, and can find none. Study after study has found that the health benefits of walking and cycling, compared to driving a car, vastly outweigh the health costs, by a factor of around 20 to 1. In other words, with all risks considered, walking and cycling are vastly safer than driving. I do find on your site a lot of advice about safety devices such as seat belts and helmets, which can reduce injuries by 20-50%. Why not then recommend active transportation, which is proven to reduce injuries by over 90%? Surely that should be a major focus of your site? When factors such as reduced air pollution, noise pollution, and reduced injury to third parties are included, the safety benefits are much greater still. Sadly, there is even discouragement of active transportation on your site. I read, for example, "Children under the age of 10 should not ride their bikes on the road." I assume this was meant to read something like "Children under the age of 10 should be accompanied by adults or older children when riding on the road". My own children have been riding with me on roads from the age of 5, quite safely. They simply ride behind me, on quiet streets, following my wheel. Your poor advice will do no good, but simply encourage parents to drive their children much more than necessary. Please correct it. I think a useful analogue to your advice about active transportation is the following. In Canada, food-borne illness causes an estimated 11 million illnesses per year, leading to perhaps 30,000 hospital admissions and about 500 deaths. Much of this disease results from eating fresh fruit and vegetables. Processed foods, such as Kraft Dinner, are "safer" in this respect. Yet should an organisation like Parachute recommend that children be fed only processed food? Obviously not, since the health benefits of fresh fruit and veg vastly outweigh the risks. The situation with active transportation is strongly analogous to this. I look forward to seeing improvements in the information and advice you offer about active transportation. Is it Crazy to Ride without a Helmet? IN a provincial court last Friday morning, Vancouver resident Ron van der Eerden was defending his right to ride a bike without a helmet. Many people have concluded that Mr. van der Eerden is a loon. Yet a surprising fact is that, in a recent poll of British doctors, conducted by the British Medical Association, 68% agreed with him that helmets should not be compulsory for cyclists. What can account for such craziness -- among doctors of all people? To begin to find an answer, let’s ask a simple question. Compare an average person who cycles for transport, riding about 300 hours per year, with a typical motorist, also driving about 300 hours per year. Who is at greater risk of injury and death? Answer: the motorist. This may be surprising, but it is a fact. While certain risks are very slightly higher for the cyclist, namely the risks from road accidents and air pollution, these increases are massively outweighed by lower risks of cardiovascular disease, cancer and diabetes, among other risks. A study published just this week in the British Medical Journal found that the risk-reductions of cycling (in Barcelona) compared with driving outweigh the risk increases by a factor of 77. Other studies have estimated the cost-benefit ratio at 20, or as little as 7, but no study has found that driving is safer. Cycling is far safer than driving. This is something to bear in mind when thinking that someone is crazy to ride a bike without a helmet. If you’re an average Canadian, then that cyclist’s risk of death and injury is far lower than yours. Who is the crazy one here? These studies take no account of whether a bicycle helmet is worn or not, since it makes very little difference. To see why, we can describe the situation with some rough, but reasonably accurate, numbers. Let’s compare two people, Chris and Mike. Chris cycles for an hour, while Mike drives his car for an hour. As a result, Chris’s life expectancy is reduced by about 5 minutes, due to the risk of death in a road accident. Mike’s life expectancy is also reduced by about 5 minutes, for the same reason. However, exercise is known to increase life expectancy, so Chris gains about 100 minutes in life expectancy from that. Overall, Chris gains 95 minutes, and Mike loses 5 minutes. Now, what about the helmet? A head injury is the sole cause of death in about 30% of cyclist deaths, and in the recent scientific literature helmets are estimated to prevent about 10-30% of such injuries. Hence wearing a bike helmet might reduce Chris’s chance of death by 3-10%, corresponding to an increase in life expectancy (per hour of cycling) of 9-30 seconds. In comparison with the general gain of 95 minutes, from cycling itself, the further gain of a few seconds from wearing a helmet is trivial. Looking at these figures, it is little wonder that helmet laws, wherever they have been introduced, have had no noticeable impact on the rates of cyclist injury and death. And that the safest countries to cycle in are those where almost no one wears a helmet. Helmets are a non-issue for cycling safety. There is also something perverse about fining someone for taking a personal risk, when the majority who take much larger risks are not fined. Given the clear fact that cycling (helmeted or otherwise) is far safer than driving a car, why are cyclists fined? As shown above, leaving one’s helmet at home costs a cyclist a few seconds of life expectancy, per hour in the saddle. If that same cyclist chose instead to drive a car for that hour, he or she would miss out on some 95 minutes of added life expectancy. The law guides us toward the more dangerous action. We should also remember the “second-hand risk” in driving a motor vehicle, i.e. the risk imposed on third parties. Driving for an hour costs other people a total of about 5 minutes of life expectancy as well. The law apparently prefers us to put others at risk rather than exposing ourselves to a much smaller risk. Now, one might argue of course that even a small gain is a gain, and so wearing a helmet still a smart thing to do. At the same time, however, it’s not something to get worked up over. And it certainly isn’t a matter for legislation. Is Safety Now a Religion? For many years I've been bugged by the constant appeals to "safety" in our society. It seems that, if a policy has nothing at all to recommend it, on rational grounds, then it's invariably supported by an appeal to safety. The very word has a kind of magical power, and is almost impossible to resist. "I'm sorry, but it's a safety issue." Who can argue against that? More recently I've started to wonder about the sources of this practice, and begun to suspect that it has its roots in our post-religious culture. It is, I am starting to believe, the result of a religious impulse, the need for salvation. So what do we do with that fear? Our Christian ancestors had one strategy, and now we have another. The Christian approach (shared by other religions) is to acknowledge that there is no safety in this world, which is arbitrary and chaotic. Yet we have nothing to fear, since our safety is with God, who guards our life and will bring us into his kingdom. "And as surely, sinner, as thou canst put thy trust in God, thou art safe" (Charles Spurgeon, "Salvation and Safety", p. 4) It's this understanding of safety that comforted early Christians as they waited to be eaten by lions, for example. The present approach is quite different, of course. With no God, our safety cannot reside in another world. We must be safe in this world. And here we see the source of the irrationality in the present safety religion. For the world just isn't safe. The Christians are right on this point: the world is arbitrary, chaotic and unpredictable. Our psychological need for a safe world just doesn't make it so. I realise that, these days, saying that the world isn't safe (and cannot be made safe) is some kind of blasphemy. Our modern scripture says that there are no accidents, but only "preventable injuries", with the obvious consequence that injury-free living is a real possibility. (We just need more regulations, more inspectors, more safety gadgets ...) By denying the possibility of safety I am saying, to our culture, that there is no heaven. For some time now I've been following the debate about bike helmets, looking at the arguments for and against. This case provides a very good illustration of the safety religion in Canada (and no doubt elsewhere). The arguments against wearing bike helmets, and especially against legislating their use, are simple and rational. The absolute risk of injury and death from cycling is very low. And wearing a helmet doesn't make much difference to that risk, if any. These arguments would appear to be irrefutable, yet the majority reject them. How do they respond? Judging from various internet discussion forums, that I've been reading, the typical response is emotional, fear-driven, and grounded in the need to be safe. I reject all false gods, including the modern idol of safety. I refuse to worship it. I prefer to live in the real world, and worship the real gods of reason, truth and love. Having received a free Cycle Analyst from ebikes.ca, as part of their twice-a-month giveaway, I was inspired to put in a proper dashboard as well. A piece of walnut veneer plywood looks a lot nicer than white coroplast! I like the large screen of the new unit, which is much easier to read. It also has a lot of extra features, being version 2.2, such as enabling the throttle to control the motor current rather than the voltage. The basic features of my new bike were described in a previous post. In this post I'll show some close-up shots, and explain some of the technical details. This first shot shows the dashboard. Right now it's just a mockup made from twinwall plastic. (I have plans for a nice piece of plywood.) The computer is the Cycle Analyst 2.0 from ebikes.ca. Their new large-screen model would work better here. The switches control two front lights. The second shot shows the front panniers, with the child seat base between them, and the power switch for the motor and lights behind that. The child seat itself fits into one pannier, as you see. Now we see the child seat installed, held in place by a single bolt into the base. The seat is by Wee Ride, but most of it has been chopped off. The foot rests were very small, for example, whereas the panniers allow even a six year old to ride comfortably, in something like a kneeling position. The seat base also houses most of the electrical connections, including the Cycle Analyst shunt, as can be seen when the lid is flipped up. Here you see the motor gearhead, mounted inside the frame triangle. The motor is available from Cyclone, with the gearhead attached. This is the 24V, 360W version, and weighs about 3kg altogether. The controller is inside the motor case. The planetary gearhead provides about 9.5 : 1 speed reduction, and the chain provides another 2.3 or so (32/14), for a total of about 22 : 1. This is using the middle (32 tooth) chainring. I can also use the large (42 tooth) chainring, for a total of 29 : 1, so that the motor runs at higher rpm. This means less current, and more range, but less power and a higher-pitched sound from the gearbox. The motor chain tension is adjusted simply by sliding the motor up and down the mounting. You see how the wire entry point is protected. Finally we see, from above, the attempt to make the whole bike aerodynamic. The idea was to approximate the familiar "tear drop" shape of aircraft wings and so on. I can't say I've noticed much drag reduction though! I wonder if joining the front and rear panniers together, with side panels of some sort, would make much difference? This is a continuation of my "Bike Project" post. About two years ago my cheap Raleigh frame reached the end of its life, as the pivot bushing for the rear swing arm wore out, and couldn't be replaced. 1. The low placement of the motor exposed it to water and mud. 2. The 8 speeds were fine for city commuting, but hauling a heavy trailer around the Gulf Islands required additional low gears. 3. The WeeRide front child seat mounted to an ugly, heavy steel bar clamped between the headset and seat post. It had to go. 1. Holes were cut to mount the motor to one plate, in the middle of the frame triangle, a location that protects it from the elements. All the potential entry points for water are actually between the plates. 2. The motor was turned around, putting its drive sprocket on the left instead of the right (the rotation reversed). The left crank was replaced with a crankset, so that the motor chain could still drive the cranks as before. But the existing triple crankset on the right was left intact, so that the standard 27 gears remained. 3. At the top, these plates were joined by a sturdy piece of aluminium U-channel to form a base that the WeeRide attaches to by its usual bolt. Detail of how the carrier struts attach to the frame. The front panniers then re-attached easily to the aluminium plates, and the fairing went back onto the panniers. I made fibre glass rear panniers to match the front as well. I've been meaning to document some of my ideas and designs concerning bicycle transportation, and now seems like a good time. I've commuted by bicycle since I was eleven years old, when I passed my Cycling Proficiency Test and received a permit to bike to secondary school. Until around 2000 I rode classic 12-speed sports bikes with drop handlebars, but then I started to experiment. For bringing things to and from work I attached some steel boxes, intended for hanging file folders. They locked, and were totally waterproof. They were a bit noisy though, going over bumps in the road, especially when carrying metal objects. I wondered if full suspension might be a good idea. At about the same time I started to experiment with rain ponchos. The idea I had was for one that was as small and tight as possible (no big flapping thing). More like a tent than than poncho, hence the provisional name "bike tent". It attached to the frame of the bike, by means of a bar that projected forward from the headset. The hem of the poncho was stiffened by a rather elaborate contraption consisting of a chain threaded through short pieces of plastic tubing. (When the chain was put under tension, the hem became stiff.) It worked well, although I still needed to wear waterproof boots and gaiters. 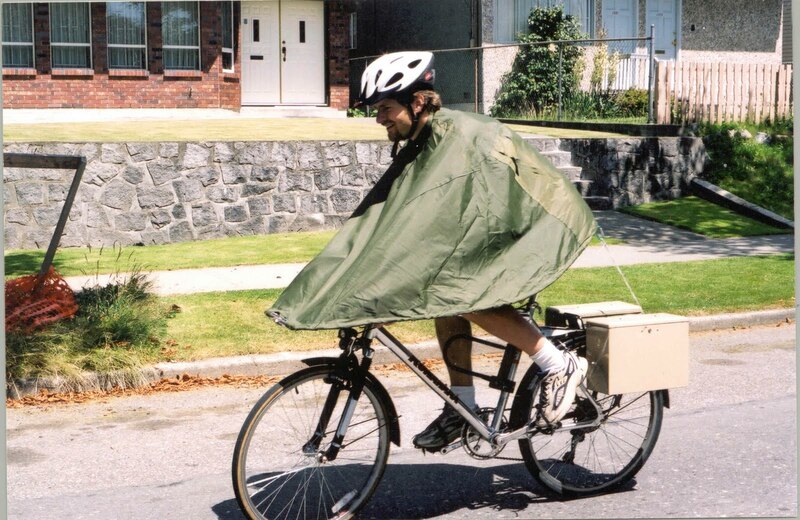 I thought about putting panniers at the front, the idea being that they would block some of the rain hitting my shins, as well as improving the bike handling. Here's a picture of the styrofoam plug I made, intending to make the part from fibre glass. The plug was shaved down to the point where I could ride with hitting my knees on it! Unfortunately the bike itself was stolen at this point. Time for a new bike, and chance to experiment with full suspension. Here are the front panniers, and I stuck a bit of a fairing on the front of them, a bit like a motorbike. I thought it might look nice, as well as perhaps making it more aerodynamic. You'll also see the aluminium tubes added to strengthen the rear carrier. It looked better with a lid, and a paint job. Now, at about this time my wife and I had our first child, and I wanted to bring him with me. Throwing him in the cargo box made a good picture, but wasn't practical for the roads. But products are available for this sort of thing, fortunately. One doesn't have to invent everything! 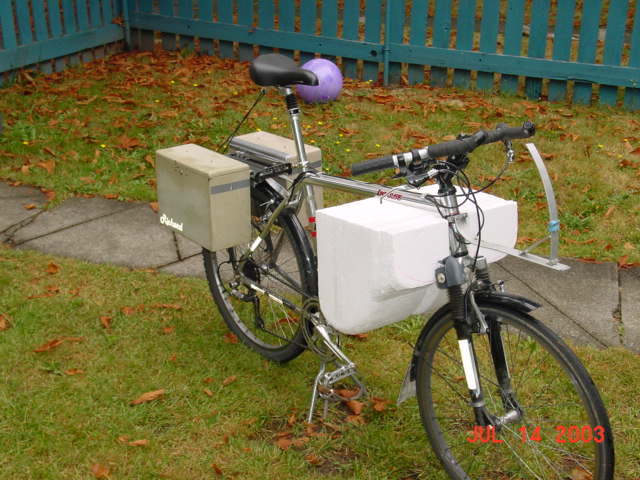 So the bike was developing nicely into a pretty useful machine for getting to work, carrying groceries, children, etc. But for a while I'd thought about adding an electric motor to the bike, to see how that would be. 1. It's perceived as dangerous. 2. It's too strenuous (especially going uphill). 3. The range is too limited. 4. You get wet, or otherwise have to put on a full-body rain suit. 5. You can't bring enough stuff with you. #1 is of course a misperception. The best measure of the total risk of an activity is its effect on life expectancy, and cycling increases life expectancy (as well as general health). We just have to get the word out. #2 is addressed by adding an electric motor. The motor's output is roughly that of a fit human, about 1/2 horsepower, which makes a big difference. #3 is also addressed by the motor. It allows higher speeds, at the same or lower level of effort by the rider, so that longer commutes become feasible. #4 is addressed by the bike tent (see above and below). It's quicker and easier to put on than a rain jacket, pants and overmitts, and it's much better ventillated, so you don't get sweaty. (Especially with a motor as well.) You can ride to work in your work clothes, even in heavy rain, and arrive perfectly dry. #5 is addressed by stay-on-the-bike, waterproof storage panniers, as well as by trailers (see below). As you see, I chose a mid-drive system, where the motor is mounted to the frame and drives the crankset. The engineer in me liked the idea of the motor driving the wheel through multiple gear ratios, so that the motor is always close to its peak power and efficiency. (This is the Cyclone motor, by the way.) 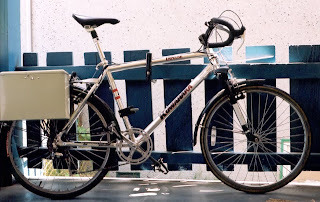 This first setup had 8 speeds, from the cassette on the back wheel. I figured I didn't need any low gears, with the extra 360 Watts on board.